The perfect addition to a meal. 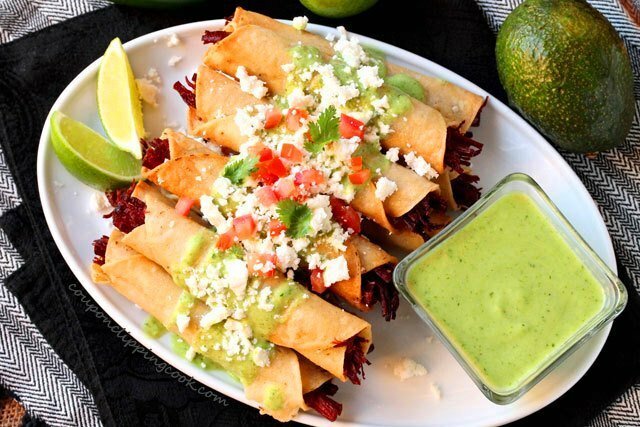 Have you ever been to a restaurant and tried something different that tasted especially good, or was served in a unique way? I just love to get new food ideas this way. 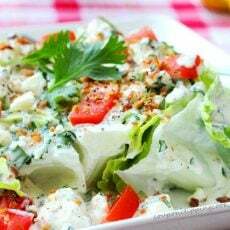 Recently I ordered a delicious blue cheese wedge salad at a restaurant and instead of the lettuce being shaped in an upright wedge; it was in the shape of a disc that was about 3 inches thick. 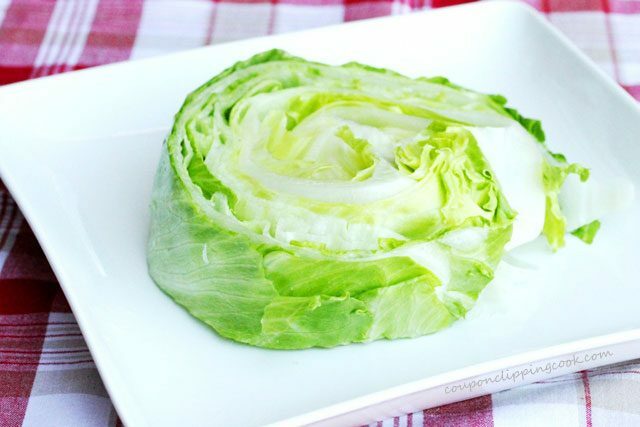 All I could think of was how fun this shape of lettuce is because you could pile on so many more toppings when the lettuce lays flat on the plate instead of it having a pointed top. So of course I had to make a version of my own. 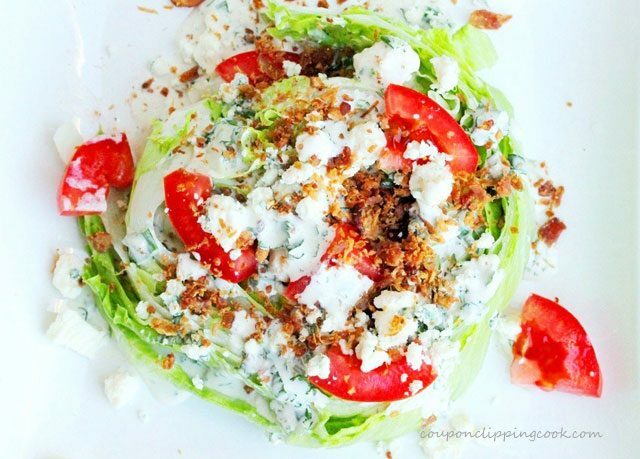 I especially love how the dressing and toppings stay nicely on top of, and inside the nooks and crannies of the lettuce so you can get a little of every ingredient with every bite. 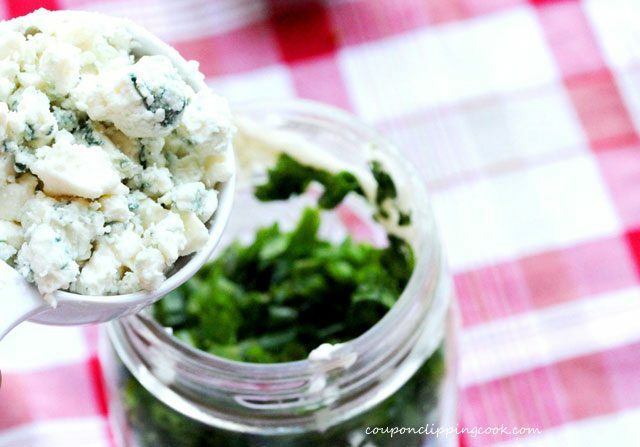 Oh and the homemade blue cheese and cilantro salad dressing is super easy to make and tastes wonderful. 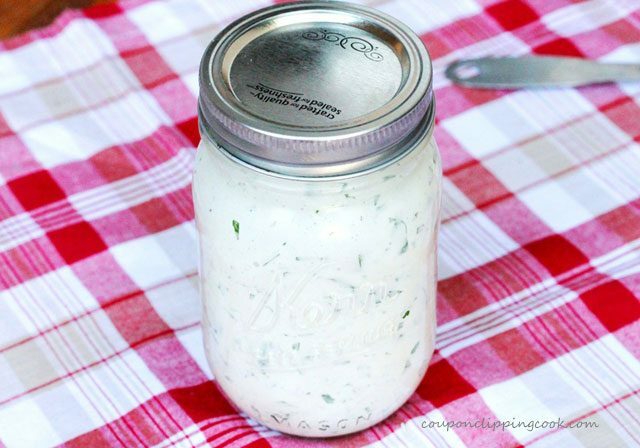 If making this in a Mason jar, tighten the lid and shake to mix all of the ingredients together. 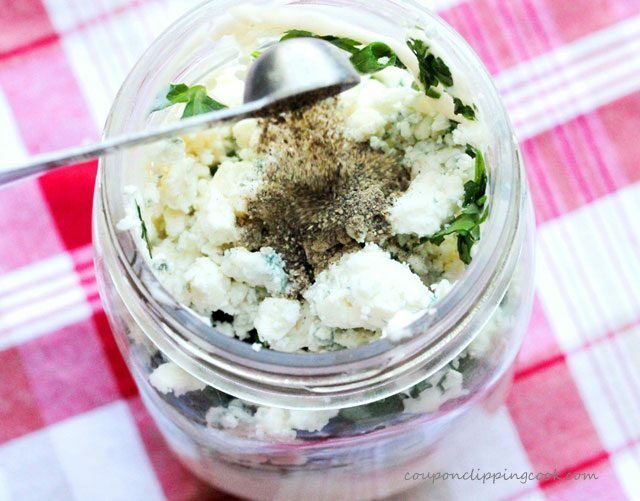 If making this in a bowl, whisk all ingredients together. Do a taste test and add more salt if needed. 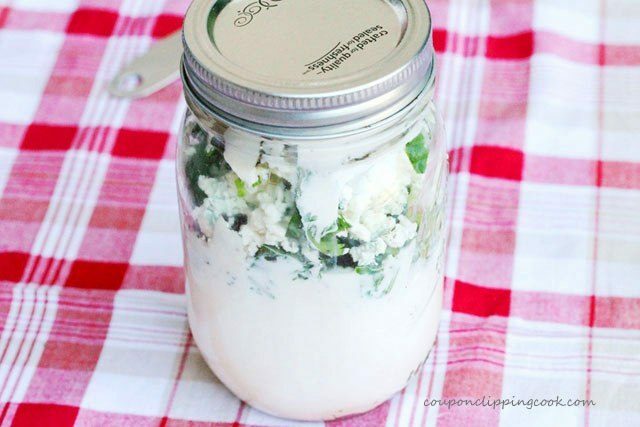 Put in the refrigerator (covered with plastic wrap if using a bowl) and store until just before serving. 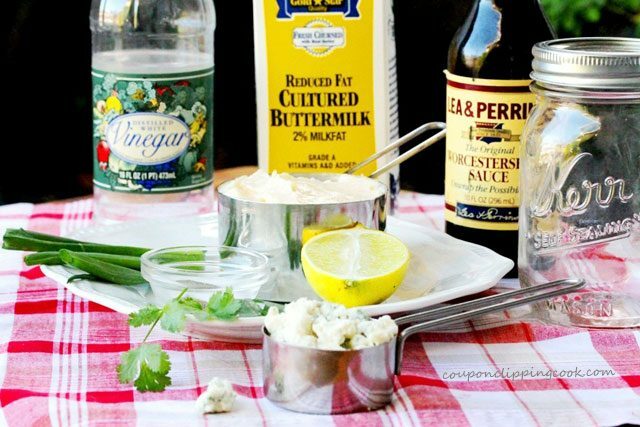 Serve right after making the dressing or chilled. 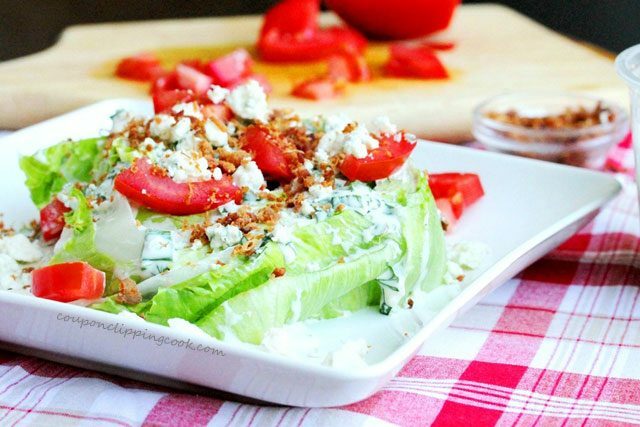 Cut a head of lettuce into 4 slices that are about 2 to 3 inches thick (thickness may vary depending on the size of the head of lettuce). 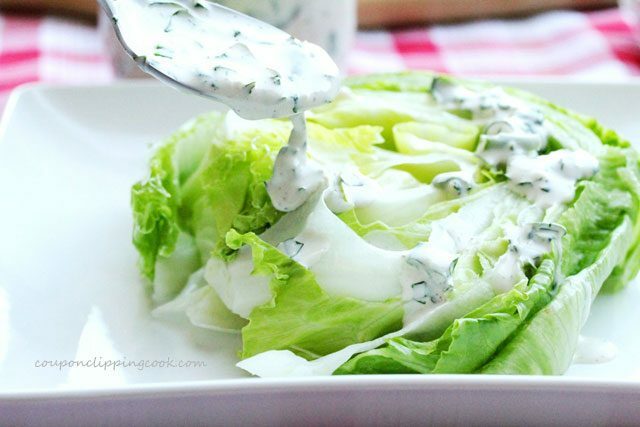 If you would like all 4 slices to be about the same size, you’ll need a second head of lettuce. Then cut 2 slices from the middle section of each head of lettuce. 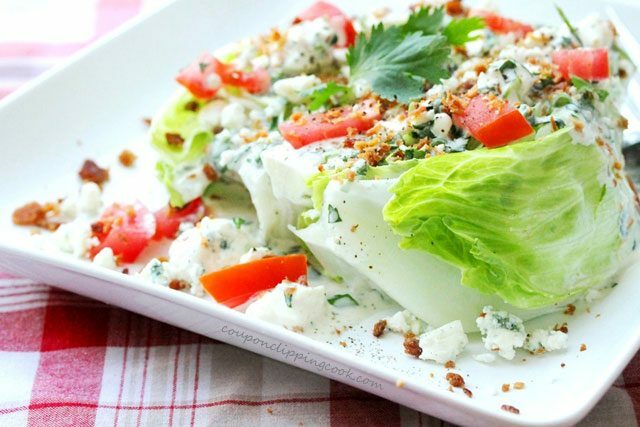 Lay each wedge of lettuce on a serving plate. 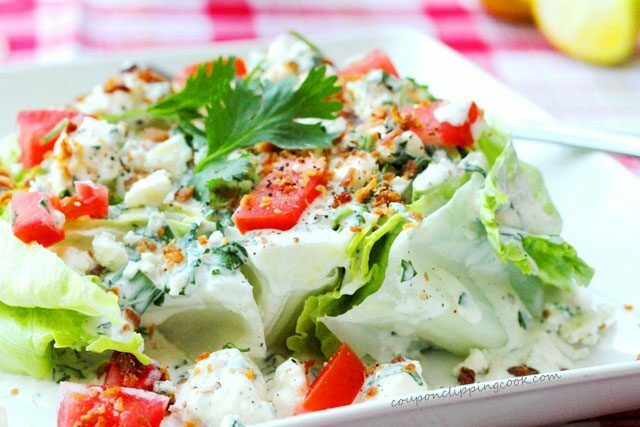 Drizzle cilantro blue cheese salad dressing on top (reserving some dressing to top the salad). 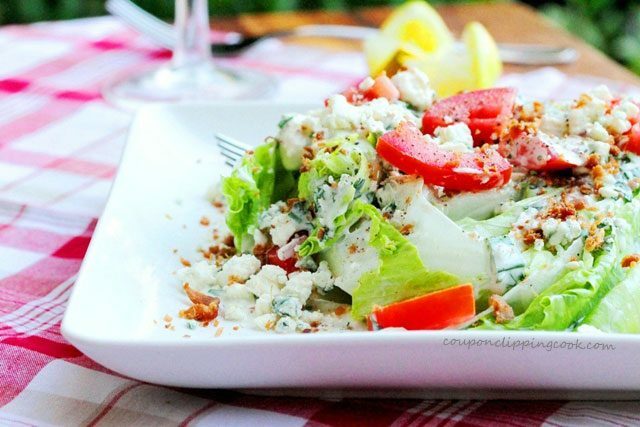 Top the salad with chopped tomatoes, crumbled blue cheese and crumbled bacon. 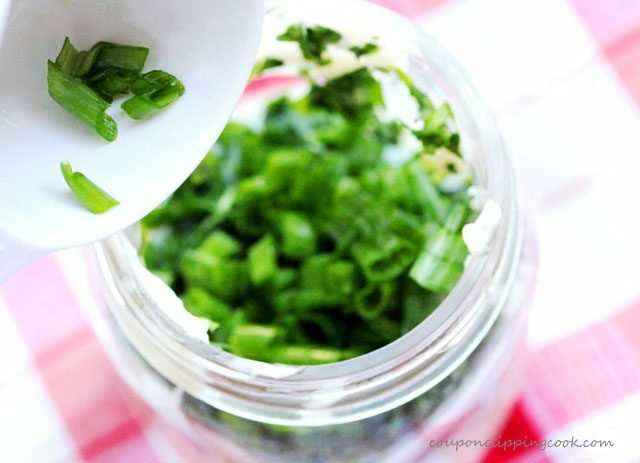 Then drizzle the remaining dressing over the toppings and sprinkle fresh ground pepper on top. Then enjoy each and every flavorful bite. 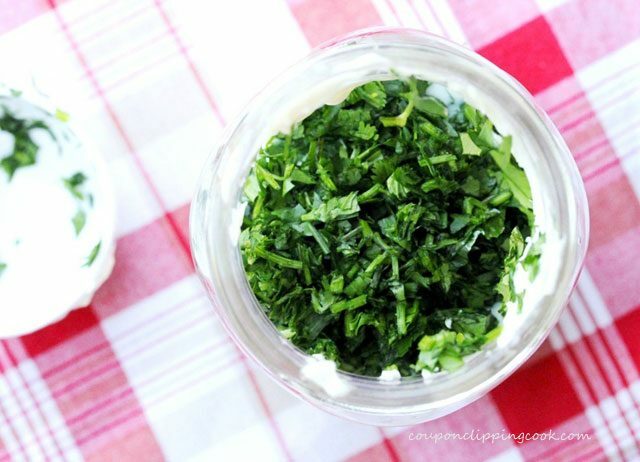 To a pint-size Mason jar or a medium size bowl, add mayonnaise, buttermilk, lemon juice, chopped cilantro, chopped chives (or tops of green onions), vinegar, and two dashes of Worcestershire sauce. 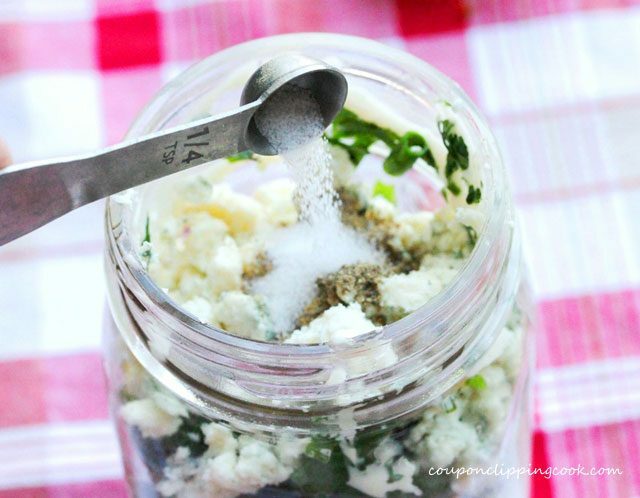 Next add crumbled blue cheese, pepper, and salt. 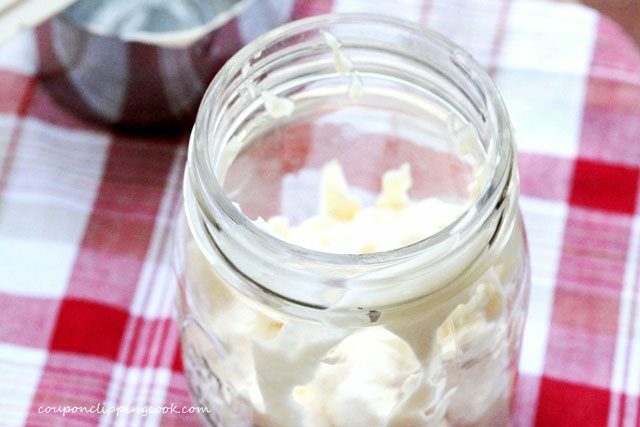 If using a Mason jar, tighten the lid and shake to mix the ingredients. 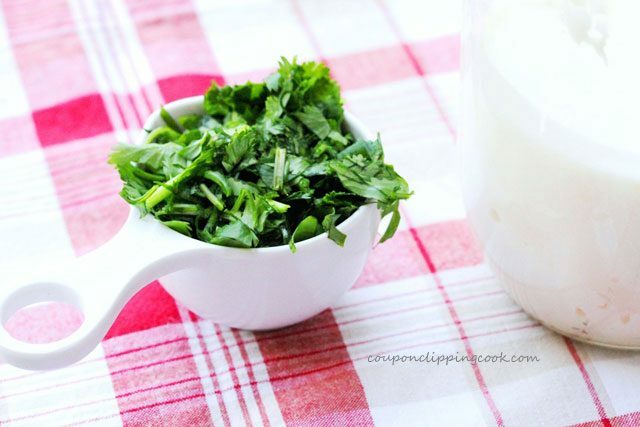 If using a bowl, whisk the ingredients together. Store covered in the refrigerator until just before serving. Mix the ingredients again just before serving. 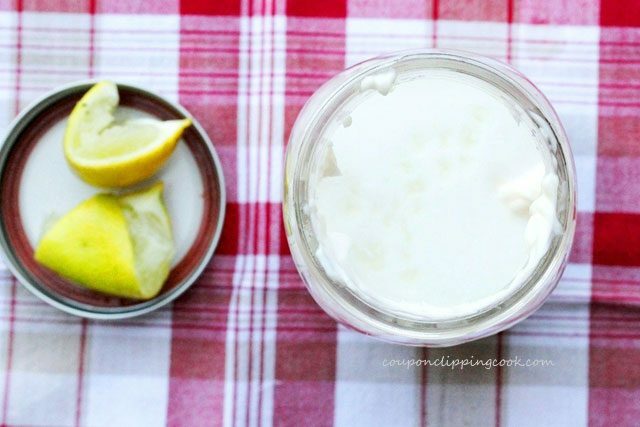 Can be served right after making it or chilled. 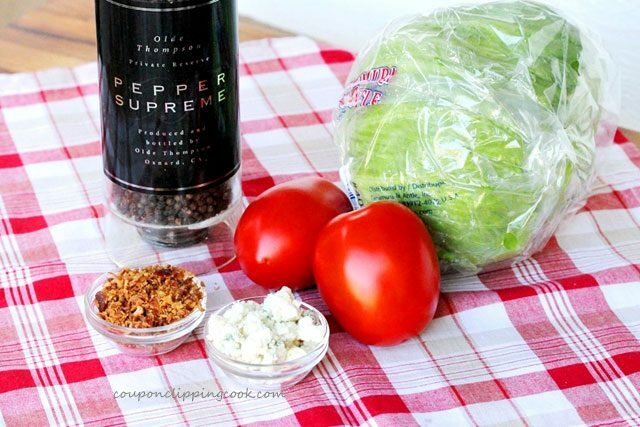 Cut the head of lettuce into 4 thick slices (about 2 to 3 inches thick depending on the size of the head of lettuce). If you would like all 4 slices to be about the same size, you’ll need a second head of lettuce. 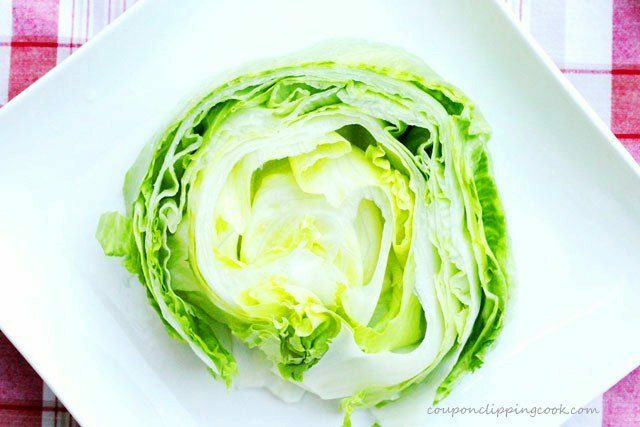 Then cut 2 slices from the middle section of each head of lettuce (the end pieces on each head of lettuce will be leftover). 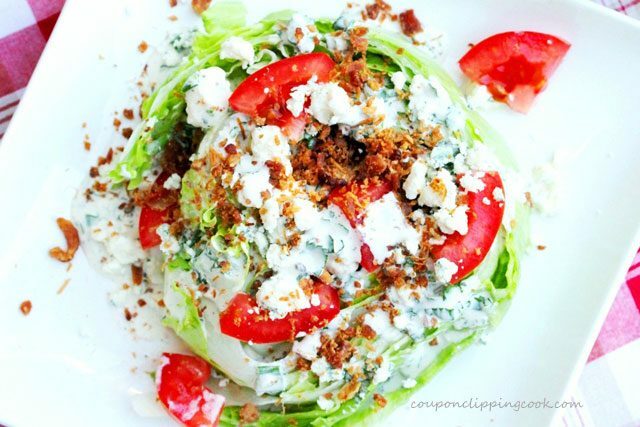 Top with chopped tomato, crumbled blue cheese, and crumbled bacon. 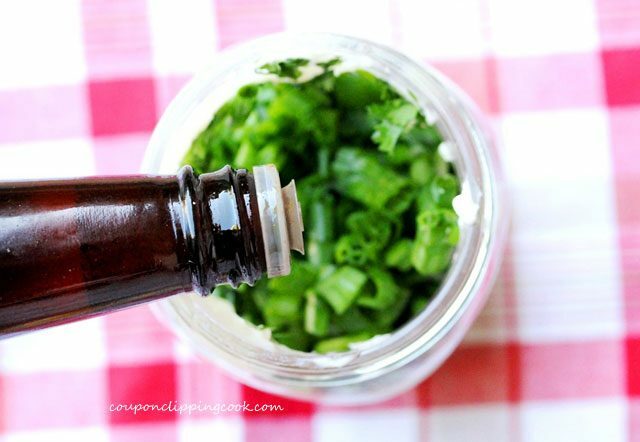 Then drizzle the remaining dressing over the toppings. 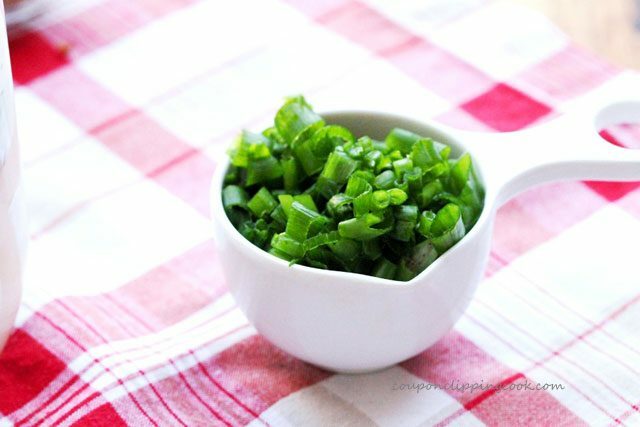 Sprinkle fresh ground pepper on top and serve. Well salad never looked so good-yum! 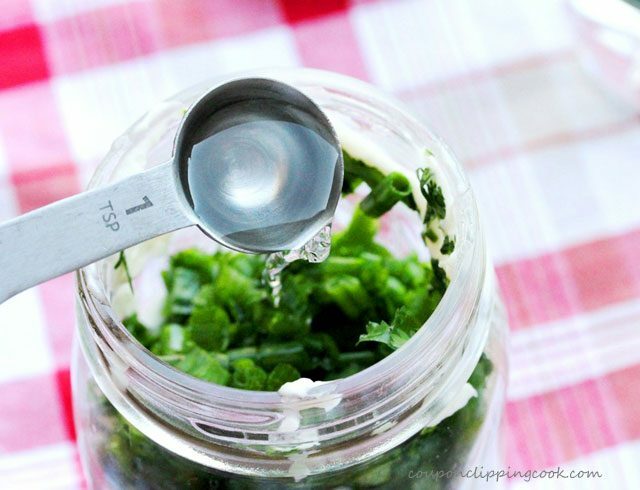 The tart dressing with the cilantro and chives does sound heavenly. It is not even 5 am and I am ready for a salad. Tasty post! Thank you Tina. Have a nice weekend.